Houston ISD Superintendent Richard Carranza this week withdrew a plan to deeply cut funding for the district’s magnet programs over the next three years, shelving a proposal that had angered parents and some school board members who consider the specialized academic programs to be jewels in an oft-troubled school system. The proposed cuts, outlined in a presentation to the HISD board last week, would have eliminated all extra funding per student to many of the district’s 121 magnet programs by the 2019-2020 school year while cutting funding to many of the other programs by hundreds of dollars per student. Only funding for secondary-language and early-college programs were spared. But after the plan triggered a backlash from magnet school supporters, Carranza and district officials pulled back the proposal and said they instead planned to conduct a review of the district’s magnet funding and programs. HISD spokeswoman Lila Hollin said in a written statement on Wednesday that the district had no plans to cut funding or make changes to magnet schools for the coming 2017-2018 school year. “HISD magnet programs are reviewed annually. Discussions about the equitable funding of schools – both magnet and neighborhood campuses – are part of that review process,” Hollin wrote. She added that a comprehensive review of the magnet program would likely be completed by January. Magnet schools and programs have been a touchy subject in Houston ISD as their prevalence and prominence has grown. While some are more diverse both in terms of race and economic status than many other district schools, critics have argued that they accept a much larger percentage of white and Asian students than those groups account for district-wide. Only 8 percent of HISD’s students are white, according to TEA data, yet they make up about 36 percent of students at Carnegie Vanguard High. At DeBakey High, about 50 percent of the students are Asian, even though only about 4.7 percent of students district-wide belong to that ethnic group. But the district’s demographics don’t match those of the city overall, largely because more-affluent white families have generally opted to send their children to private schools or to other districts. About 15 percent of those 18 and under in the city of Houston are white, according to Census data. Houston ISD Trustee Anna Eastman said she’s glad the proposed cuts to magnet schools and programs appear to be off the table for next year, but she worries that any future cuts along the lines of the recent proposal would be “incredibly drastic.” She said cutting extra funding to the magnet programs is not the way to bring more diversity to those campuses. I haven’t been paying close attention to this, but nothing that happened here surprises me. As the story notes, there have been reviews of the magnet program going on for some time, and they usually don’t get very far because the stakeholders really don’t like the proposals. The last section I quoted above captures the conflict succinctly – this program and its schools are very successful and desirable, but there’s limited space and the schools’ demographics don’t come close to mirroring the district as a whole, and they draw students away from their neighborhood schools, which can suffer as a result. It would be best to have more magnet-style programs in more schools all around the district, but that’s a hard thing to do when resources are scarce. I don’t see anything about this dynamic changing much in the near future. It’s a very different campaign this time around. The Greater Houston Partnership and other local organizations whose members own some of the city’s priciest commercial real estate have come out in support of a ballot measure over whether the Houston Independent School District should pay its share of property taxes to the state as part of the so-called Robin Hood system of school finance. The business coalition, which also includes Central Houston, the Houston Building Owners and Management Association, Uptown Houston, the Houston Business Realty Coalition and the “C” Club, said the school district should pay the $77.5 million it owes to the state. The detachment process would affect more than 80 commercial properties in the Galleria, Greenway Plaza, and downtown Houston, the coalition said in a statement Monday afternoon. While the value of commercial property slated for detachment this year is $8 billion, HISD estimates it would climb to $22 billion in 2018. BOMA supported recapture last November, one of not too many groups or officials to do so. (If the other groups took a position last time, I don’t know what it was.) Very simply, most of the endorsements I saw last year were against the recapture, and most of the ones I am seeing now are in favor. In fact, as I was drafting this post, I saw an ad on TV (on ESPN during the Cubs-Pirates game) in favor of the recapture referendum, paid for by a group called “Houston Taxpayers for Quality Education”. None of this is any guarantee of success for the Yes side – this whole election is too much of an oddball to feel secure in any prediction – but for what it’s worth, the most consistent message I have seen is a message of voting for recapture. The Chron looks at the first day of early voting and some area races. Early voting began Monday for local elections next month that will determine who leads increasingly diverse Pasadena, the fate of a major school bond referendum in League City and whether Houston’s largest school district pays tens of millions to the state to comply with a controversial policy and avoid a potentially bigger financial hit. Across Harris County, 1,153 voters turned out Monday for the elections, figures show. They included many who live within the Houston Independent School District and voted for a second time on “recapture,” a process through which so-called property tax-wealthy school districts pay the state to help fund districts that collect less. Meanwhile, in Stafford, longtime Mayor Leonard Scarcella, who has held his seat since 1969, is running unopposed. Sugar Land has only one contested seat: that to fill the position of Harish Jajoo, a city councilman who ran unsuccessfully in 2016 to be the city’s first South Asian mayor. He chose not to seek re-election as a councilman. Of note among school district trustee races, Lamar Consolidated ISD’s Anna Gonzales, who was indicted on charges related to bribery in a case that was dismissed last year, faces an opponent in Joe Hubenak, the son of the late state representative and LCISD board member by the same name. In Brazoria County, Pearland voters are heading to the polls to vote for mayor, City Council and school trustees. A letter from a real estate agent denouncing “liberal gay rights Democrats” trying to take over the city and school board elections there – which are nonpartisan – drew ire from many progressive groups, as well as longtime Mayor Tom Reid and two other candidates endorsed by the letter. In Clear Creek ISD, the district is asking voters to approve a $487 million bond that officials say is needed to build new schools and keep up with growing student populations. But conservative groups are concerned that the bond’s steep price tag includes too many unnecessary frills, such as $13.7 million to renovate Clear Creek High School’s auditorium. Consternation over the bond has set up a showdown between two warring political action committees, or PACs, which have spread from national races down to municipal races and local bond referenda. The Harris County Clerk is sending out its daily EV reports as usual, with a new feature this time – they are posting that report online, which you can find here. As that is a generic URL, I presume it will simply be updated each day, so be sure to hit Refresh if you’re going back at a later date. The vast majority of the vote in the usual places should be for the HISD recapture referendum. There’s no way to tell how many of the mail ballots are for that and how many are for the other races. I may venture some guesses at overall turnout later in the process, but for now I’m just going to shrug and say this is all too new and unprecedented to make anything resembling an educated guess. Have you voted yet (I have not yet), and if so how are you voting on the HISD issue, if that’s on your ballot? Of the five candidates who met with the Chronicle editorial board – two declined – only Van Houte was willing to bluntly and accurately diagnose the challenges facing Harris County’s second-largest city. Legacies of favoritism, opacity and, yes, discrimination continue to hamper progress at Pasadena’s City Hall. A petrochemical boom is driving growth all across east Harris County, yet Pasadena remains constrained by a political leadership that, as Judge Lee H. Rosenthal wrote in her recent opinion, has denied equal opportunity to all of its citizens. Plenty of Pasadena residents certainly won’t enjoy reading Rosenthal’s words. Every other mayoral candidate preferred to pick up the pom-poms and cheer on the city’s blue-skies future. But discrimination is like a cancer that can fester beneath the friendly surface of civil society, from a road plan that ignores Hispanic neighborhoods to a redistricting scheme intentionally designed to disenfranchise Hispanic voters. Structural discrimination won’t go away by ignoring it. Pasadena needs a mayor who is willing to confront these challenges. Chemotherapy is never pleasant. Van Houte has a record of standing up for the hard fight during her eight years on City Council – and like so much of Pasadena politics, it all began with street construction. Back in 2006, Van Houte was part of a successful campaign opposing a road expansion project through her neighborhood. 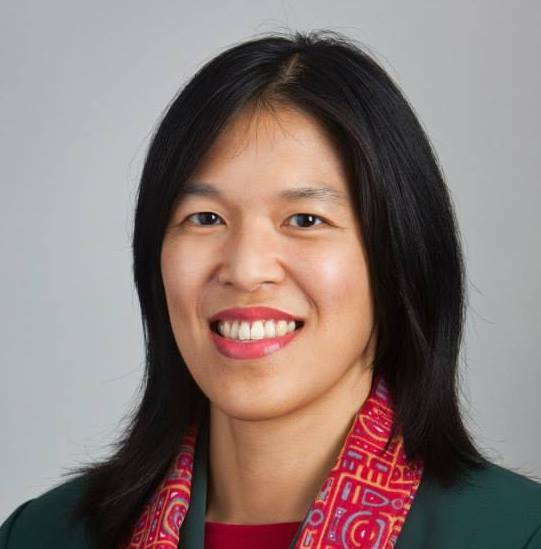 That activism led her to represent the northeast District D at Pasadena City Hall. Van Houte, 60, eventually worked with other representatives to block an infrastructure bond that failed to properly address dilapidated northside neighborhoods. Mayor Isbell responded by shoving an unconstitutional redistricting scheme down Council’s throat and trying to silence his opponents. Nevertheless, Van Houte persisted. 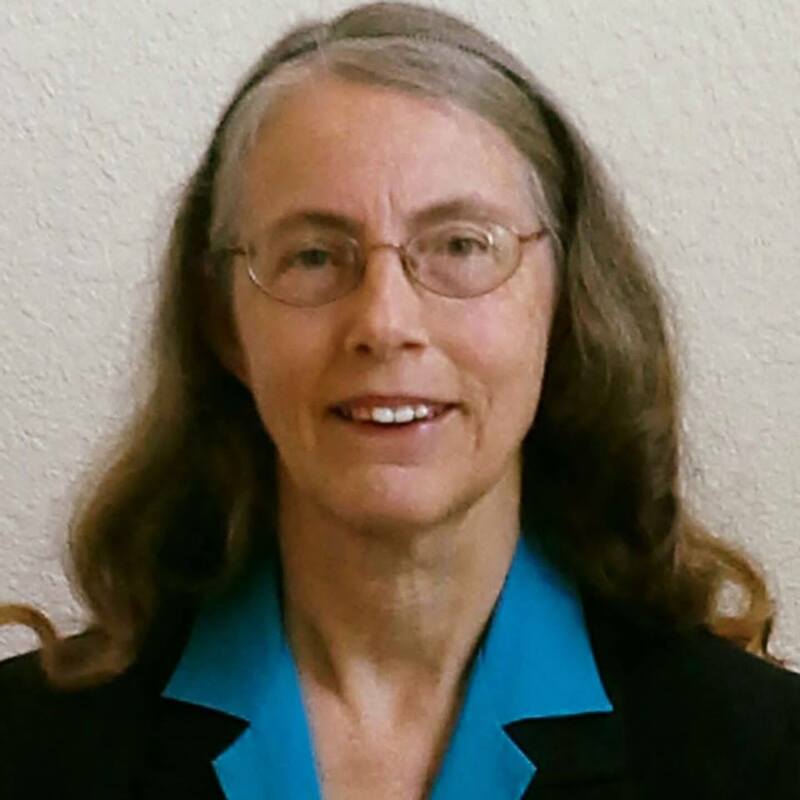 She was forced out of a City Council meeting and saw her seat redistricted away, but that didn’t stop Van Houte from winning her current at-large position. Now she wants to replace the term-limited Isbell and run a city government that’s open to all of Pasadena instead of merely the well-connected. This means fairness in contracting, competitive bidding, soliciting community input and promoting transparency. Van Houte also said that she wants to reinstate a public transit circulator for senior citizens that the city had stopped funding. My interview with Van Houte is here; I also interviewed Gloria Gallegos, who was not mentioned in the endorsement article. I’d love to know who the two no-shows were. I was chatting with someone about the Pasadena Mayoral race the other day and we observed that it was relatively low profile, which likely would be the case most years but maybe not so this year, given the court case and the sea change from the Isbell era and the large field of candidates. I think it just may be the case that with seven candidates, this race will surely go to a runoff, and that’s when the real excitement will happen. Closer to home (for me, anyway), the Chron endorses a Yes vote on the recapture re-referendum. As in November, May voters have to decide between two lousy choices – either authorize HISD to write a big check to the state government every year for the foreseeable future, or give away a huge chunk of Houston’s tax base forever. If AGAINST voters prevail, the district will lose future tax collections on detached properties. This matters in particular because some of those tax revenues are used to pay back the district’s bond debt. As more and more commercial properties are detached, a larger percentage of the responsibility to fund public education would shift to homeowners and remaining business owners. A FOR vote won’t fix school finance. But it makes the best of a bad situation. The Chron endorsed a vote against recapture last year not once but twice. As you know, I agreed with them then, and I agree with them now. In my observation, most people and groups making endorsements on this issue are on the Yes side as well, whether they had been that way to begin with or not. That ought to help, but I think a lot of people are still confused by this whole issue, and if they are still confused and voted No last time, I’d have to think they’d vote No this time. If they do vote, of course, which maybe they won’t since we’re not used to voting in May. This is going to be a very weird election. Be that as it may, my re-interview with David Thompson on the matter is here. I hope it helps clear up any lingering questions you may have. I don’t know if the Chron intends to do any further endorsements or not. They have not traditionally done so in May elections before, but as we know, This Time It’s Different. Plus, there are contested Mayors races in Katy and Pearland, where as in Pasadena that has not usually been the case. I’ll understand if this it, but I’ll still hold out some hope that it’s not. As noted, early voting begins April 24 and runs through May 2. Here are your early voting locations and hours, not just for HISD but also for (deep breath) City of Humble, City of Pasadena, Humble Independent School District, Northgate Crossing Municipal Utility District 2, Northwest Harris County Municipal Utility District 28, Oakmont Public Utility District, and Harris County Water Control & Improvement District 91. Here’s their official webpage. I think you’ll be able to discern their position. 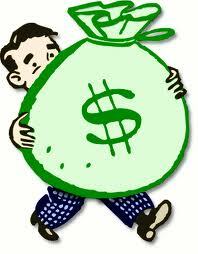 The district will continue to make annual recapture payments as long as property wealth grows. Our total tax collections will continue to grow to offset these payments as property values rise. The district will have more capacity in the future to fund schools. Under current law, those commercial properties will be permanently detached, and the district will permanently lose those tax collections for district operations. The district will lose debt service tax collections used to pay back bonds, which is debt used to build schools. The district will face budget cuts and have less capacity to fund schools. There’s more, but you get the idea. In addition, Trustee Anna Eastman, who was one of the louder voices in favor of the November referendum, has am op-ed touting this one as well. Please note that the referendum wording is dictated by state law – HISD has no discretion, so don’t gripe at them if you don’t like it. The HISD Recapture Flyer (English version) and Recapture FAQ came home as printouts in my fourth-grade daughter’s weekly folder, so at least one school is getting the word out to parents. Have you received any official communication on this, from your school or an elected official? Leave a comment and let me know. 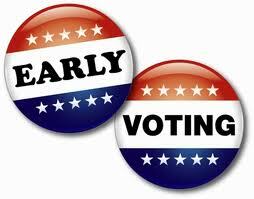 Remember, early voting begins on April 24 and runs for a week, with the final vote on May 6. Here are the numbers as we now face them. Houston ISD voters will face a choice of either paying the state’s $77.5 million recapture fee, or risk losing $98.4 million in tax revenue over the next fiscal year, according to new dollar figures given to trustees. Those were the options presented to HISD trustees Thursday when for the first time school district officials gave firm numbers on both scenarios since voters last November told district officials to not pay the state’s recapture fee. Recapture involves the state’s mandate that the district pay millions to help subsidize poor districts. Houston ISD faces recapture because, according to the state’s funding formula, the district is deemed property wealthy even though most of its student population is economically disadvantaged. Glenn Reed, general manager of HISD’s Budgeting and Financial Planning, said the district would end up with less money over time if the state detaches property than if it pays the state’s recapture fee. That’s largely because Houston commercial real estate values are expected to grow in the next five years. 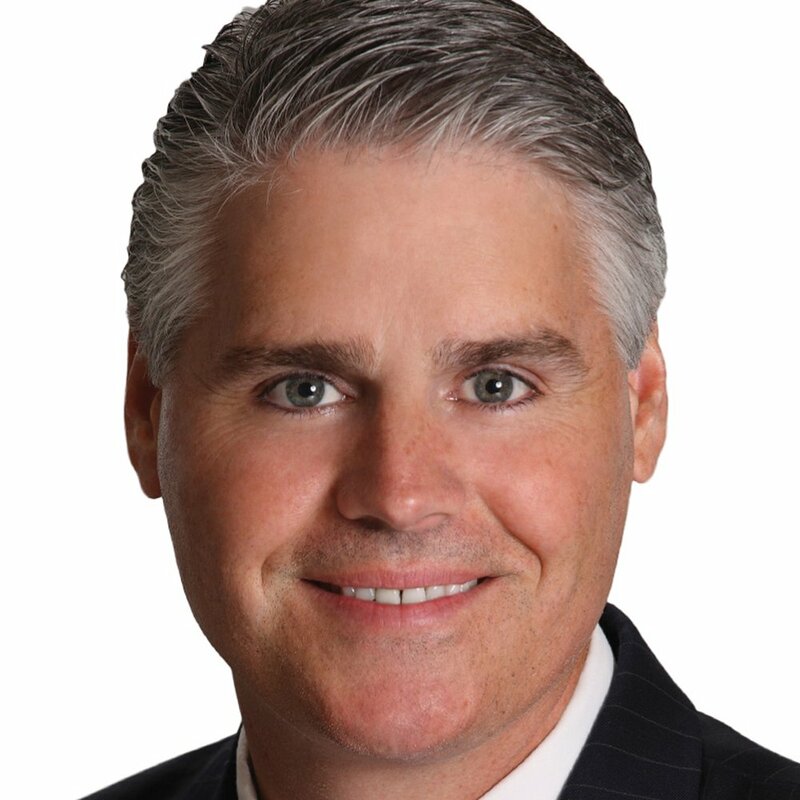 If the state takes away some of those properties, Reed said the district will lose out on both those property taxes and any increases in taxes realized through higher property values. During the meeting, Reed also reviewed the language that would appear in May’s referendum. 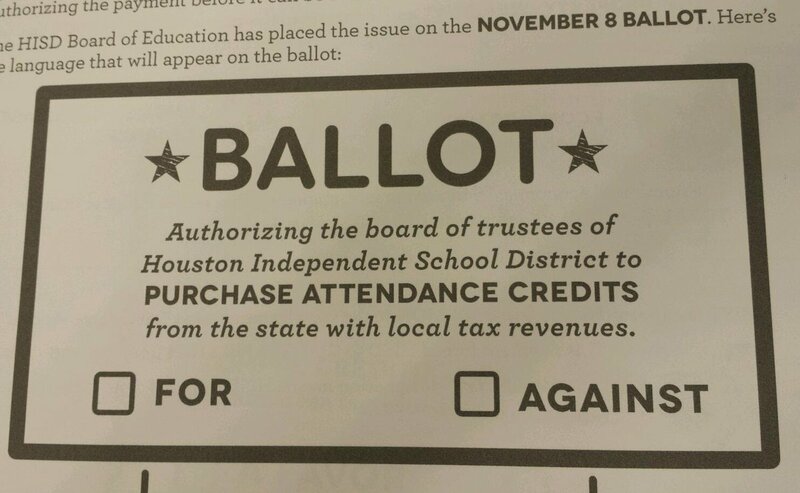 It would ask: “Authorizing the board of trustees of Houston Independent School District to purchase attendance credits from the state with local tax revenues.” A vote “for” purchasing attendance credits would mean the district would willingly pay the state’s recapture fee. 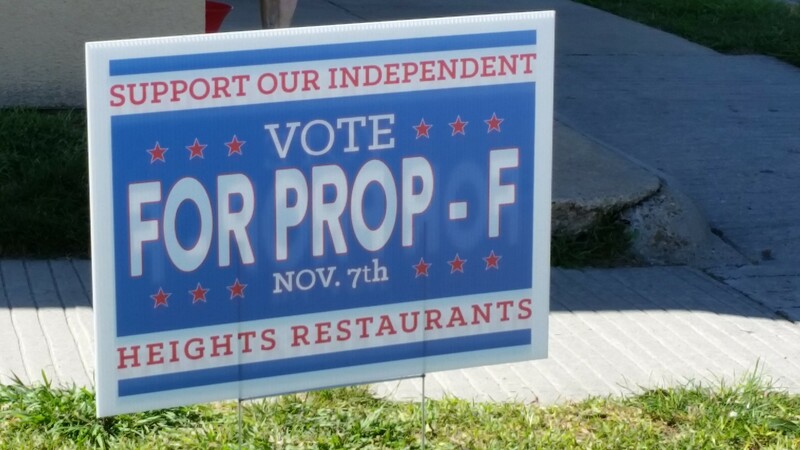 A vote “against” would mean the state would detach some local personal property. If HISD keeps all its commercial properties and benefits from increased property values, Reed estimated the district could see its budget continue to grow over the next five years by $66.8 million after the recapture payment is made. If the commercial properties are detached, he said the district could see a loss of $98.4 million in 2017-2018 and would lose any future property value growth. See here and here for the background. As noted before, I voted No on the November 2016 referendum on the hope that rejecting recapture might spur some legislative action and the knowledge that we could vote again if we needed to. I figured a re-vote would be to possibly reconsider the consequences of detachment if nothing good happened; I honestly didn’t expect a re-vote after a positive development like the TEA reinterpretation of the Robin Hood law. But here we are, and I believe that having achieved a substantial victory, albeit not a complete one, we should grab onto it and move forward. So I will vote in favor of recapture this time around, which by the way will be less than eight weeks from today. I figure the encore vote will have much lower turnout than the original did. Has any of what happened since November changed your mind, and your vote, on this?